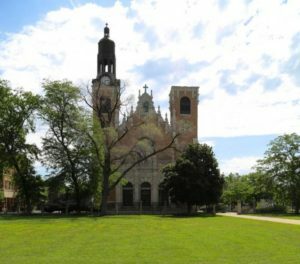 St. Stanislaus Kostka Church is located near Polonia Triangle, which was the heart of Chicago’s vibrant Polish community when the cathedral was built in the 19th century. Since, St. Stanislaus and Chicago’s Polish community have changed. While Illinois is still home to one of the largest populations of Poles in the United States, the majority of Poles is now concentrated in Chicago’s suburbs rather than the city itself, according to a report from the Polish American Association. Soon, he also got to know artist Malgosia Sawczuk, who operates the The Art Objects Conservation Lab along with her husband, as she was painstakingly restoring St. Stanislaus to its former glory. The piece premiered during a performance Neil organized, Nostras Voces (Our Voices), which took place on April 11th, 2015, and which WFMT broadcasts Friday, December 23, 2016 at 8 pm. 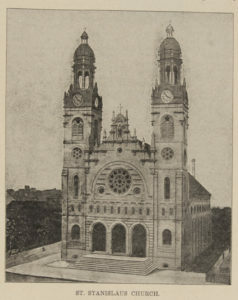 Below, see Sawczuk’s painstaking work to restore St. Stanislaus, along with her descriptions of the restoration processes. Learn more about the Nostras Voces concert and broadcast at the bottom of this page. 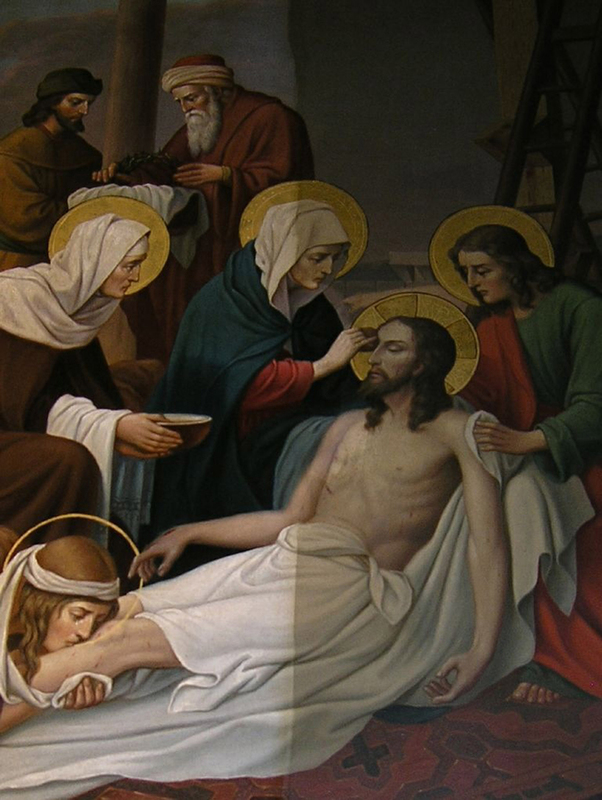 St. Stanislaus Kostka Church houses extraordinary oil paintings on metal substrate which appear in the Stations of the Cross. The high artistic level of these art works faded during the years due to a thick layer of dirt embedded in the surface, as well as several scattered areas of paint loss. The conservation treatment included cleaning, inpainting, and re-gilding of the halo and fully restored the beauty of these art works. 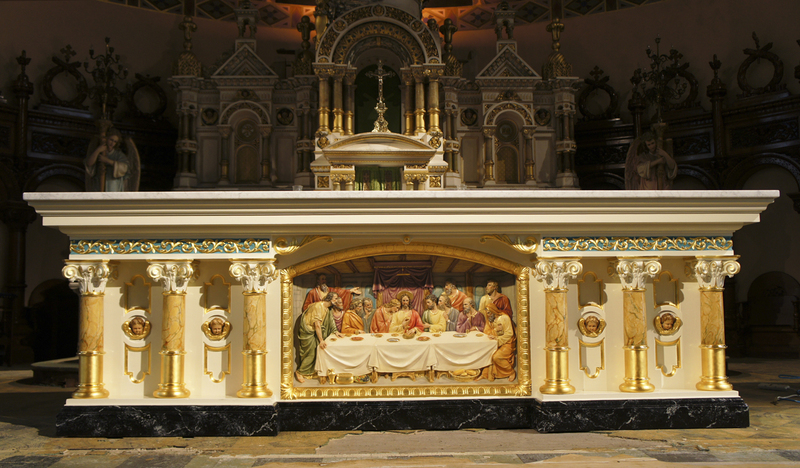 A view of the liturgical table from St. Stanislaus Kostka Church in Chicago after conservation. The range of the conservation treatments here was very wide and included both a structural stabilization of the wood as well as restoration of the aesthetic appearance. During the process the object was cleaned, the several over-paintings were removed, the missing carved fragments of the bases and capitals were reconstructed, and the cracks were filled. The original color of the table was recreated. The frame and all originally gilded areas were gilded anew with the use of 24 karat gold. 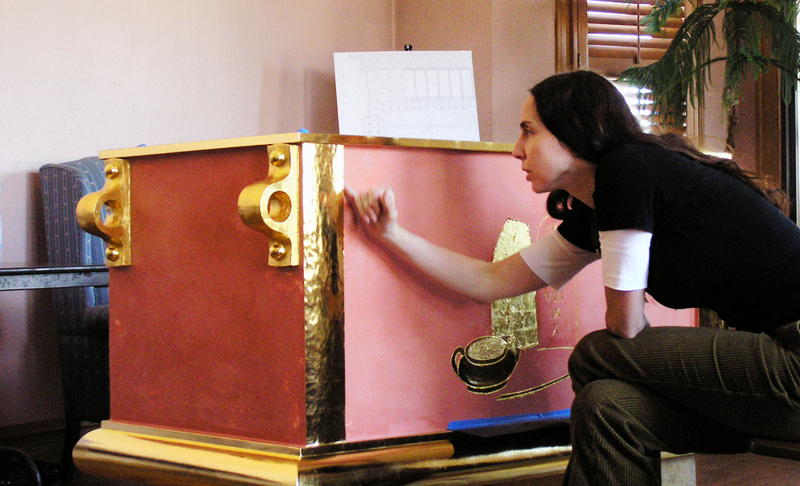 This picture depicts the process of gilding the surface of the Ark of Mercy, a contemporary piece inspired by the Ark of the Covenant. Two techniques of water and oil gilding were used here, applied to both the surface of gesso and red bole (a mixture of clay and animal or fish based glues). Oil gilding will provide a beautiful surface coating of matte gold; in contrast, water gilding allows for a burnished mirror-like sheen surface. The arrangement of the two Angels, Ark of Mercy and Madonna symbolizing the Ark of the Covenant was created in wood by Polish sculptor Stefan Niedorezo and gilded by Margaret Sawczuk, art conservator. 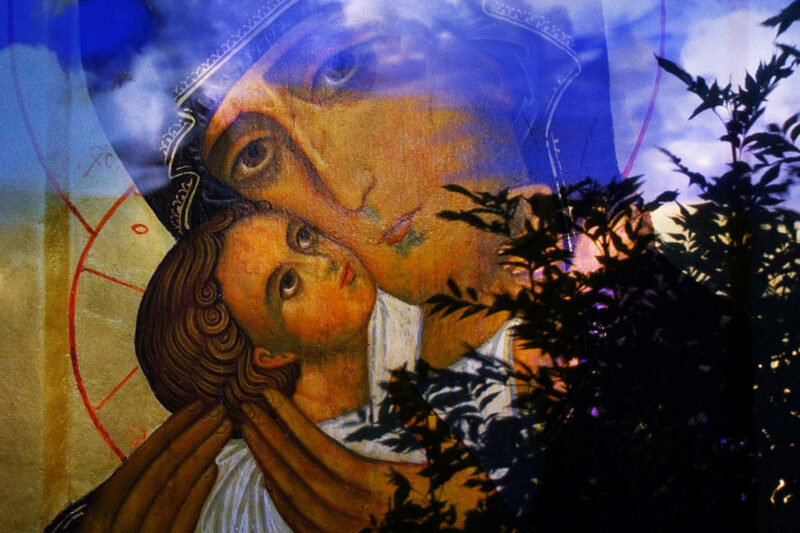 The sculpture of the Madonna was not only covered by gold leaves but also painted with many layers of colored, transparent varnishes which allows for a vibrant energy of the gold leaves. The conservation of the side altar at St. Stanislaus Kostka Church lasted a year before the poor condition of the wood and surface was fully stabilized and restored. Uncontrolled changes in temperature and humidity caused deep cracks in the structure as well as an almost total destruction of the gesso and gilding, which lost its adhesion to the substrate and had a tendency to fall. The layer of paint was brittle and covered with network of craquelures. An immediate intervention was essential to protect the altar and prevent further deterioration. The conservation treatments included a consolidation of the wood, stabilization of layers of gesso, removal of over-paintings, filling of cracks and small losses, reconstruction of missing fragments of floral carved ornaments, and gilding of original paint layer. During the conservation process dozens of missing precious stones were also replaced. Nostras Voces featured the composer, William Neil, as pianist, flute soloist Tom Gullion, soprano Josefien Stoppelenburg, and the Organ Choir of St. Stanislaus. 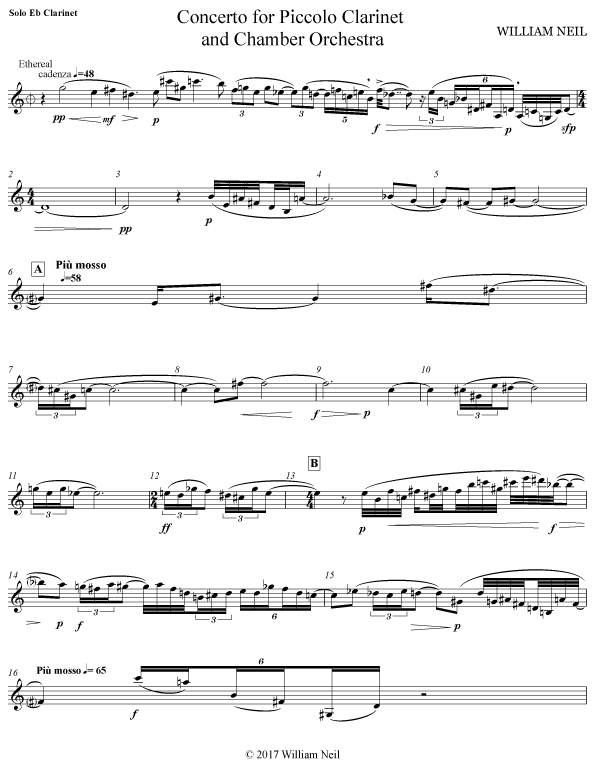 The concert begins with an improvised work by Mr. Gullion for wooden flute and piano entitled “Quiet.” This is followed by the world premiere of Mr. Neil’s “Deep Blue,” scored for piano and bass clarinet. The finale of the concert is to be the first performance of “Out of Darkness into Light” featuring Ms. Stoppelenburg; Tom Gullion on bass clarinet, soprano sax, and alto flute; and William Neil, the composer, playing piano and digital acoustics. The presentation on WFMT also features interviews with Mr. Neil and Ms. Stoppelenburg. The music producer is Eric Arunas and the program’s host and producer is Kerry Frumkin. Listen to excerpts from the interview with Kerry Frumkin, William Neil and Josefien Stoppelenburg.